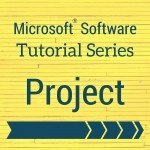 The Microsoft® Project 2010 program is the world’s most popular project management software. It is used world-wide to plan so that complicated projects execute smoothly. The Project software can also be used to assign resources, and track projects while they’re running. Managers will learn how to set up, plan, organize, and track projects. You’ll learn lots of useful features that professionals use to help their projects run as efficiently as possible.